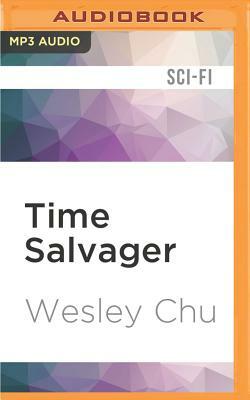 Time Salvager a fast-paced time travel adventure from Wesley Chu, the award-winning author of The Lives of Tao. James is a chronman, undertaking missions into Earth's past to recover resources and treasure without altering the timeline. The laws governing use of time travel are absolute; break any one of them and, one way or another, your life is over. Most chronmen never reach old age; the stress of each jump through time, compounded by the risk to themselves and to the future, means that many chronmen rapidly reach their breaking points, and James Griffin-Mars is nearing his. On a final mission that is to secure his retirement, James meets Elise Kim, an intriguing scientist from a previous century who is fated to die during the destruction of an oceanic rig. Against his training and his common sense, and in violation of the chronmen's highest law, James brings Elise back to the future with him, saving her life but turning them both into fugitives. Remaining free means losing themselves in the wild and poisonous wastes of Earth, somehow finding allies, and perhaps discovering what hope may yet remain for humanity's home world.